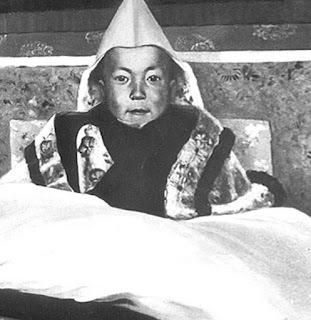 In order to be Dalai Lama, you have to be the reincarnation of the previous Dalai Lama. Since the current one is 80, his reincarnation may come sooner rather than later. There is no Vice-Dalai Lama or Dalai-Lama-in-waiting. Instead, new ones are discovered during an arduous, mystical search involving visions and funeral pyre smoke among young boys by the High Lamas of Gelug Tibetan Buddhism. This can take years -- last time it took 4 -- and sometimes they find more than one, so they have to be winnowed down through time-honored methods of testing. However, through this quiet and esoteric process the true Dalai Lama eventually emerges. "But not so fast," says the People's Republic of China. "We'll decide who can reincarnate and who can't, thank you very much!" Just to reinforce their point the Chinese government passed a set of reincarnation laws in 2007, regulating just what kind of a person the current Dalai Lama's soul can transmigrate into. This code contains such stirring spiritual words as, “The selection of reincarnates must preserve national unity and solidarity of all ethnic groups, and the selection process cannot be influenced by any group or individual from outside the country." “The highest level of living Buddhas must be approved by the central government,” Phurbu Tsering, the abbot of Sera Monastery near Tibet's capital, Lhasa, said at a meeting of China's rubber-stamp legislature on Monday. “Other Living Buddhas must be approved by local governments." Dalai Lamas tend to come from Tibet but the 4th one, Yonten Gyatso, was born in Mongolia and the mysterious nature of uncovering new Dalai Lamas means that a reincarnation could theoretically occur anywhere. Tenzin Gyatso, the current Dalai Lama, absolutely refuses to reincarnate in China. In fact, he may just decide not to reincarnate at all. But if he does and you happen to be a young boy at the time and you don't live in China, there's an outside chance that you could get the job.